CIS generates reports according to the norms ISO, for airborne insulation, impact noise insulation and reverberation time. CESVA Insulation Studio is a powerful software application designed to calculate and generate reports of acoustic insulation in accordance with norms ISO 16283-1, ISO 140 and ISO 717, for airborne insulation between rooms, airborne insulation of façades, impact noise insulation and reverberation time. 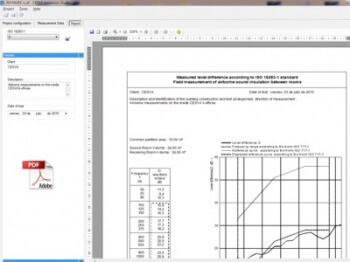 The application generates reports for both Laboratory and In situ measurements (ISO 10140-2/-3 and ISO 140-3 to ISO 140-8), and also complies with national regulations from various countries: Spain, France, Portugal, Italy, United Kingdom, Finland, Brazil, Switzerland and United States. The programme automatically creates the report quickly and simple way from data downloaded from CESVA SC160, SC-30, SC260, SC310 (*.ccf files) and SC420 (*.cdf files). CESVA insulation Studio uses a project structure where data is saved. In this way various reports can be made using the same project and the projects can also be used as templates. CESVA Insulation Studio allows to create a new project, open a project (.cif) or import project (.caf) done through CESVA Measuring Assistant software. Also can be choose all parameters from measurement report: regulation, filter, frequencial range, RT average, Reverberation time (T20 or T30), uncertainty values and RT method used for the measurement evaluation and calculus. The data can be entered manually, via cut and paste from any programme, or by dragging and dropping files on to the application. It also allows confirm the spectrum to check the self-generated operator noise. Geometrical data is also entered through the keyboard. This data can be displayed and edited graphically and numerically. 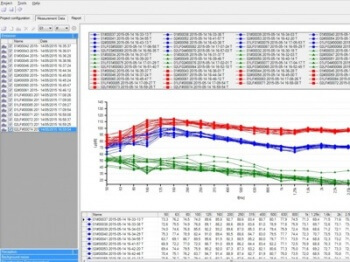 The multiple display window is perfect to compare different spectra and check their standard deviation in order to ensure no error has occurred during the measurement process. The application has, for RT measurements, the option to display the parameters of nonlinearity thus providing additional information. Editing of spectra can be carried out by direct numerical input or by visual drag over the graphic representation. Reverberation Time editing allows recalculation from the decay curve using four different methods. The application also allows you to vary the decay curve by changing the starting point and the slope used in the calculus of Schroeder. You can restore the changed values. 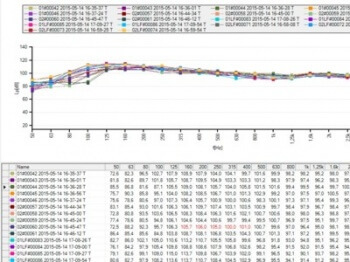 All calculations are made using high accuracy variables, following ISO recommendations for software design: spatial averages, background noise correction and result calculation. Also the corresponding rounding rules are used for the evaluation and representation of single ratings and single number quantities. 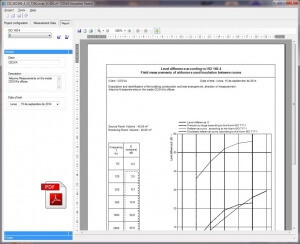 These numerical tables and graphic representations can be exported via the clipboard to other applications. Reports are generated instantaneously and a preview is shown on the screen. Direct printing or exportation to other formats is available: PDF and RTF documents or EMF metafile pictures.